One common issue for those of us that suffer from heel pain and plantar fasciitis is that the aches and pains come and go, making it hard to identify the exact cause. One of the best things you can do is to wear some shoes with either built-in orthotics or have some custom made orthotics insoles that you wear in your shoes as much as possible. However – the question then is, what do you wear after work, at the weekend, when your feet are cold or you are walking on the beach in the summer? Chunky boots with orthotics in are not ideal for these scenarios! You can get slippers with built in arch support to wear around your home, but it is also possible to buy flip flops with arch support that are designed to help people with plantar fasciitis too. Sometimes, flip flops are just the sort of footwear you need. Even if you are just hanging out on your patio at home or at the beach – they are the ideal footwear for casual days. Vionic are a great brand to choose as they are backed by good research into footwear that works for people with heel pain and plantar fasciitis. 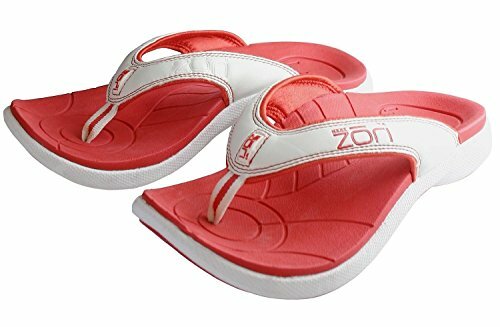 This pair of flip flops also have “Orthaheel Technology” (Orthaheel are now known as Vionic) that will help support your arches and provide good stability for your heels. The Karina model is also designed to be lightweight and features a sturdy rubber sole and a flexible EVA midsole, to match the contours of your feet. One happy customer went as far as reporting that she “can’t rave enough about this shoe”. Pros: Available in many colors, offer great arch support, designed specifically to help people with painful feet. Comes fitted with an adjustable strap. Cons: Not perfect size/shape for people with narrow feet, some complaints from customers of poor workmanship. If you look online for shoes that work well for people with heel pain, you often end up reading about Crocs and how they are perfect. These excellent flip flops are also well received and are a popular choice on Amazon. They only come in 6 different colors, but the they are made from leather and have double-cushioned comfort support – perfect for those aching feet and ankles. Many people report that these are great for helping reduce the pain from plantar fasciitis and that their steps are “pain free after slipping them on” – surely nothing could be better than that? Pros: Good reputable brand, sturdy materials designed to be versatile and hard wearing, but comfortable too. Good flip flops for for narrow feet. Cons: Some reports of breakages after normal usage (not common), no adjustable strap, some issues with sizing being incorrect or hard to determine without trying them on first. Yet another product from Vionic – more proof that they really are a great popular brand and well worth investigating when buying your flip flops. These are very similar to the Karina model, but come with different styling and unfortunately no adjustable strap. The Tide II flip flop comes with the usual excellent Vionic materials, non-slip patterned rubber soles, leather uppers and synthetic material – all in all, a great product. As per the Karina, this also comes in a wide variety of colors to suit every need. Pros: Great brand and material, lightweight, very comfortable, podiatrist-designed. Reef are another well known brand that make great footwear, so it’s nice to see them making these Star Cushion flip flops that have some extra arch support built in. They may not look like they have arch support if you look at them, but the sole is made from a soft cushion material that squashes down when you put your foot in, revealing a good amount of arch support. They also come in a range of colors too and it is recommended that you opt for a full or half-size above your normal shoe size to get the best fit. Pros: Made by Reef, a great and reputable brand, good arch support, soft sole is good for your sore feet, lightweight. Cons: Strap is not adjustable (again), some users have reported issues with the straps making their feet sore (may be due to infrequent manufacturing issues), sole may be too narrow for people with wider feet. Despite wanting to find a good range with adjustable straps to get that extra good fit, we were left wanting in this quick roundup review of the top 5 women’s flip flops with arch support. There is a fine line between what is called a sandal and a flip-flop and it appears that the sandals do offer better support and cushioning. However, they are heavier and not as easy to get on and off. That being said, we did like the Vionic Karina Arch Support Flip Flop the most as it ticked all of the boxes in our requirements. We must also give a good recommendation to the Reef Star Cushion Sassy flip flop as the most comfortable flip flops with arch support. 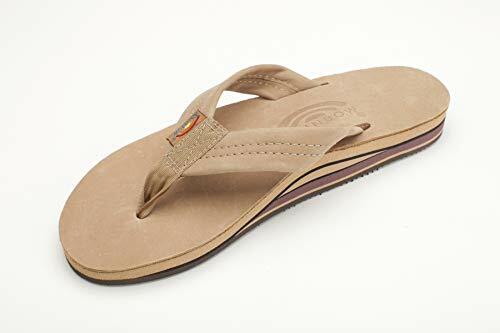 These are not the best looking flip flops (and some might say they are sandals) but they certainly meet all of our requirements when looking for mens flip flops with arch support. They have been designed to help relieve plantar fasciitis, heel and shin pain and have a good amount of arch support. They have also concentrated on helping stop pronation, where the heel rolls to one side or the other, which causes all sorts of painful problems. The Flipthotics are only available in black with the blue trim, but look great and are made from durable materials, so you should have no issues using them at home, in the street or on the beach. Pros: Lightweight, excellent arch and heel support, moulds to your foot shape, not too expensive. Cons: Not very wide – may not work well for large hobbit feet, strap not adjustable and may make them too tight. These cream flip flops are also designed to help stop pronation of the ankle, plus give some good arch support. They are actually unisex, but still look great and will be perfect for using on all surfaces, from sand to hard wooden flooring. Despite having the lowest “customer rating” on Amazon, the materials are excellent and many customers have reported that it has helped them alleviate their aches and pains and they wear them on a daily basis. You need to watch out for the sizing though. Because they are unisex, a few people have found that they have accidentally ordered the wrong size – so check the Zori sizing system before you buy. Pros: Lightweight, inexpensive, good arch and anti-pronation support, perfect for all surfaces, for men and women. Cons: Odd sizing system, sole may be too soft for some people (too much flop in the flip-flop 🙂 ). Is this a sandal or a flip-flop? Not sure – you decide. 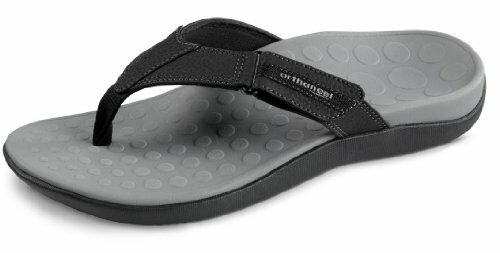 Anyways, with over 1100 reviews on Amazon, I had to include this leather flip flop from Rainbow Sandals. It is well liked and has a good level of arch support too, although they are not specifically designed with people with foot problems in mind. The Rainbow Double Layer comes in a variety of colors and is very hard wearing and tough – they might outlast you! Pros: Made from leather, high arch support, very strong materials, extra cushioning, lifetime warranty on the straps. Cons: may take longer than usual to wear in, material may stain easily, some people find that the toe straps are coarse and can cause pain. A flip flop that offers customized comfort! I think it is probably safe to say, Orthaheel (Vionic) are probably the best brand to go for. Why? Because they are designed by doctors and foot/ankle/heel specialists who have ensured that they are perfect for people with plantar fasciitis, high arches and heel pains. 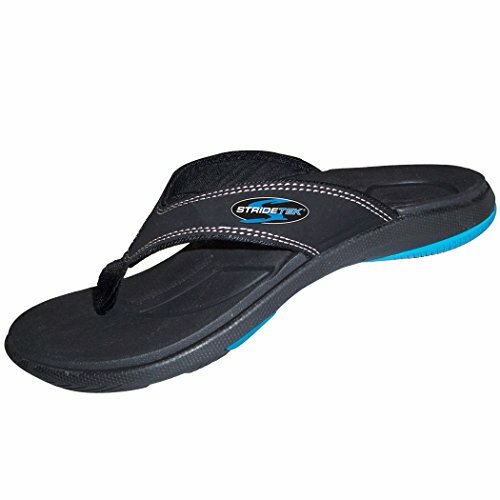 The Ryder from Orthaheel is a great looking medium-wide flip flop and is made from the usual high quality materials. They are lightweight but strong, so can be used in a wide variety of locations and are even great for wearing around the house. Pros: Made by Orthaheel -need we say more?, adjustable strap, waterproof, synthetic leather straps, deep heel cup to stop pronation. Cons: Leather parts may wear if you get them wet, not available in half-sizes, some people report that the straps are coarse, some users also complain that the arch support is not high enough. It’s better to opt for a brand that you know will offer proper support and one that has been designed by specialists, which is why we have chosen the Orthaheel Ryder as the best flip flop with arch support for men. We like that it has good design, but also the deep heel cup and adjustable strap too – something that is sorely missing from most other products. If you want to give yourself some extra arch support, prevent plantar fasciitis and heel pains and not spend too much money, these are ideal. So, there you have it, our top picks of flip flops with arch support, for men and women. Did you choose one to get? Come back and let us know which one you went for and what you thought. Or, if you have a tip or product to recommend?, leave a comment below and let our readers know. You could be saving someone from the problems of painful feet. What are the benefits of wearing flip flops? If you choose the right make and model, flip flops can give you enough support to wear them all day, as long as you are not going to walk very far. They are perfect for wearing at home or in the garden and the ideal footwear for taking to the beach. They are also very convenient to wear and don’t need too much fuss or attention. Just slip them on and off you go. One benefit of flip flops I can see is that they let the air get to your feet, stopping them from being too hot or sweaty, which can lead to swelling and other problems like blisters. Buying flip flops for plantar fasciitis – points to consider. Essentially, a flip flop is not really made from many parts, so there is not much that could be tweaked, added or removed. This makes it quite easy to ensure you are getting the right type for your painful heels. The main point to look for is that the area where the sole of your foot goes is properly supported. People with plantar fasciitis need to have the additional support in the arch to ensure that the fascia tendons are not stretched more than needed. At the rear of the flip flop, try to buy a brand that has a deeper cup for your heel. This will help give you better support and stop your foot and ankle from slipping sideways, which can cause other gait issues or problems. Once you have found one that has good arch and heel cup support, make sure you can buy a pair that have a good strap that is adjustable. Wearing a pair that move around too much on your foot will not give adequate support – so a tight and comfortable strap is essential. I am not someone who goes after particular brands, but it would pay to look for products that are made by companies that you know of and that have designed their flip flops to address the issue of foot and ankle support. Don’t fall for buying the run-of-the-mill popular brands – look for ones that have been designed for people with plantar fasciitis or foot problems. The cons of wearing flip flops. Can take time to “wear in”. Will not be as good support as a normal shoe. Flip flops are not for everyone, so wearing them might take some time to get used to. They definitely won’t be as snug as a pair of shoes, but you might feel awkward wearing them at first. Depending on the brand you choose, they might end up costing you more than just adding an off-the-shelf orthotic insole to a pair of deck shoes. The extra cost is something you need to consider. One main drawback to flip flops, even with good arch and ankle support, is that they are by no means perfect and you will definitely not get as much foot support from them as you would a proper pair of shoes. However, they will be good for shorter periods of walking and wearing around the house.